CheckUP is proud to be involved and continue to support the Queensland Primary Health Care Network (QPHCN). 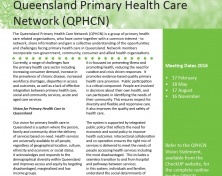 The QPHCN is a group of almost 80 state level primary health and community care related organisations, who have come together with a common interest - to network, share information and gain a collective understanding of the opportunities and challenges facing primary healthcare in Queensland. Network members incorporate state level non-government, community, consumer and allied health organisations. Although, the network was established in 2010, its precursor commenced in late 2009 through the hosting of a series of Primary Health Care Roundtables designed to link organisations and share information relating to the current national health reform agenda. It was through coming together regularly, that the organisations recognised the value of the partnerships being formed and the discussions that were taking place and agreed to formalise the Network. CheckUP currently provides the Chair and Secretariat support for the QPHCN quarterly meetings. Each meeting focuses on a priority area identified by the network at the conclusion of the previous meeting. To assist with covering catering and secretariat functions an attendance fee has been introduced for CheckUP Non-members. Previous Minutes and PowerPoint Presentations are available upon request. Contact David Millichap on 07 3105 8300. ​Topic: What's happening in Health Promotion? A listing of all current active members of the QPHCN. The QPHCN Vision Statement was developed and endorsed by the Network.